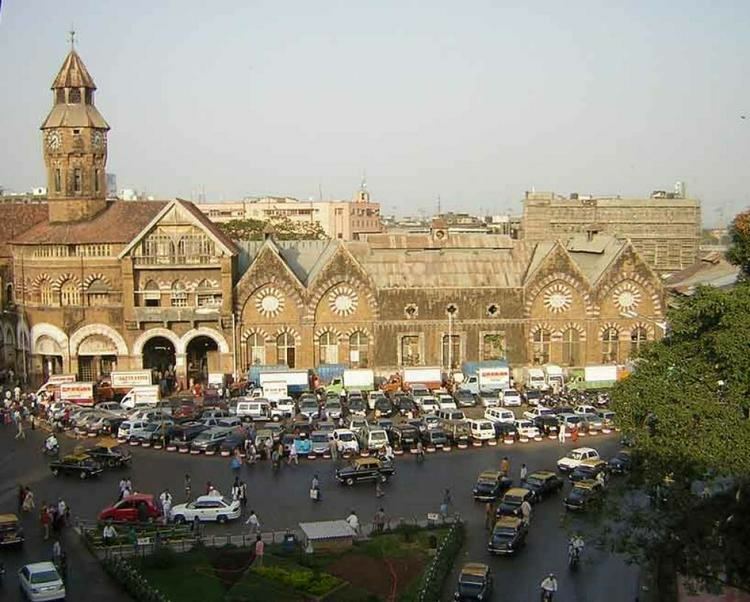 Santacruz or Santa Cruz is a section of the municipality of Mumbai. The Santacruz railway station on the Mumbai Suburban Railway, the Domestic Terminal (T1) of the Mumbai Airport and one campus of the University of Mumbai are all located in Santacruz (east). Santacruz and its neighbouring suburb Khar fall under the H East and H West wards of the Municipal Corporation of Greater Mumbai. The locality had a population of 675,951 in 1991, over an area of 12.98 square kilometers, giving it a population density of 36,668 persons per square kilometer. The then British Government set up RAF Santacruz, a military airfield, in 1942. It was home to several RAF squadrons during World War II from 1942 to 1947. The Airport covered an area of about 1,160 hectares (2,900 acres) and initially had three runways. The airfield was transferred to the Indian Government for civilian use upon Independence, and came to be known as Santa Cruz airport, the city's main airport. 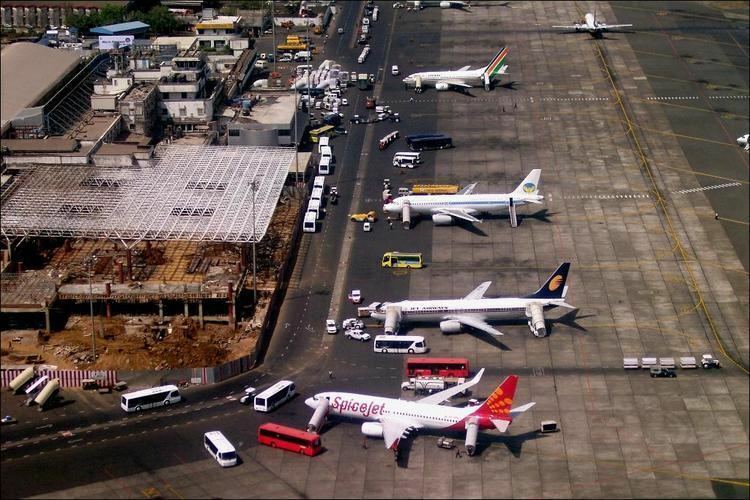 Construction of a new passenger terminal and apron began in 1950 and was commissioned in 1958. In the 1980s, a new international terminal was built at Sahar, to cater for the increasing number of passenger movements and types of aircraft; the terminal at Santa Cruz was converted to serve domestic flights and was primarily used by Indian Airlines until the 1990s, which is when Jet Airways and East West Airlines were born. The original terminal building still exists and has been given a new façade and host of interior upgrades. A second terminal complex has also been built to supplement existing facilities. Santa Cruz is bordered by Vile Parle in north, Khar in south, Juhu in west and Kurla, Bandra in east. It is broadly divided in two areas: Santa Cruz (East) and Santa Cruz (West) by the Mumbai Suburban Railway line. The Milan Subway and Khar Subway connect the two areas, passing under the rail line. Recently Milan flyover has been built which has improved connectivity between Santacruz East and West. The Western express highway passes through Santacruz East. MMRDA has built a Skywalk for pedestrians stretching from Podar School Complex (West Santa Cruz) to Western Express Highway (East Santa Cruz). Santa Cruz(East) consists of Maratha Colony, Prabhat Colony, Kalina and Vakola. 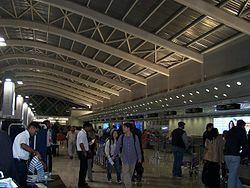 It also consists of land belonging Airport Authority of India, which consists of the Mumbai Airport and Air India Colony (which comes in Kalina). The main roads passing through Santa Cruz(E) are the Western Express Highway, Nehru Road, Santacruz-Chembur Link Road and the Kalina-Kurla Link Road. The PIN codes of this area are 400055, 400029 and 400098. Vakola stretches from the Western Express Highway in the west to the Kalina Military Camp in the east. Yashwant nagar, Dawri Nagar, Nagdevi Nagar, Vakola Bridge, Shivaji Nagar, Vakola Pipeline, Vakola Village and Vakola Masjid areas form most of Vakola, densely populated by Hindus, Muslims, Buddhists, Catholics and Jains. These communities, though tending to cluster together, live in relative harmony with each other, however, the area of Vakola was among the worst affected during the Bombay Riots of 1993. Vakola village is home to one of the indigenous communities of Mumbai, the East Indians. Formerly known as Vankola for three centuries, the village formed part of the Kalina Parish which was founded in 1606. It was in 1914 that through the initiative of Fr. C. A. Abreo at Kalina Church, that a chapel was contemplated to be built at Vankola. Mr. John Rodrigues popularly known as Jamboo donated the land, and the Chapel was finally completed and dedicated to St. Anthony and blessed on 1 January 1921. Practically all the villagers then had relatives (brothers, sisters, in-laws) either at Kalliana (now Kalina) or at Vile Parle. The Church was remodeled in 1977 to suit the changed liturgical norms. Today, St. Anthony's Church is one of the largest parishes in the Archdiocese of Mumbai in terms of Catholic population, which is estimated to include around 23,000 persons. To the south of the Vankola village were a few fields and marshy lands reaching right up to the Mithi River at Bandra East that contained a lot of wildlife, birds of all kinds and small animals. Vankola village being on a small rise, the land sloped downwards towards the marshes. All social activity of the people was centered at Kalina Village which was connected to Vakola by a small road skirting the Rye Hills which now houses the Military Camp. This small road is still in use and is used a short cut to Kalina. Anand Nagar is a large development built as transit accommodation for Post-Partition refugees, but subsequently leased out and sold to various families. Property prices in Vakola have been on a very steep upward trend in the last couple of years. Vakola has two schools run by the Catholic Church, St Anthony's Boys' School and St. Charles Girls' School. Other educational institutions include The Patuck School and College Complex - founded under the Patuck Polytechnic Trust by the Late Mr. Rustomji Hormusji Patuck, a Parsi businessman turned technical educationist, The New Model High School, The Municipal School at Vakola Bridge that includes several upper and lower primary schools in Hindi, Marathi, Urdu, Gujarati, Kannada, Telugu mediums and The Nariyalwadi Municipal school that has upper and primary schools in Hindi, Marathi and Tamil mediums. Vakola hosts the corporate headquarters of Asian Paints Limited and a significant number of large commercial banks, including Canara Bank, State Bank of India, The Shamrao Vithal Co-operative Bank, CitizenCredit Co-operative Bank, ICICI Bank and NKGSB Co-Operative Bank . The Grand Hyatt hotel is located at Vakola, on the erstwhile premises of the Standard Batteries factory. The road stretching from the Western Express Highway to the Military Camp is called Nehru Road. A tributary of the Mithi River, called as the Vakola Nallah flows through Vakola. This river overflowed during the statewide floods of 2005 on 26 July 2005 and caused massive damage to slums and housing societies along its banks. Some buildings were under ten feet of water. The neighbourhood of Vakola is the setting for the 2011 novel Last Man in Tower, by Booker Prize–winning Indian author Aravind Adiga . The East Indian village of Kole-Kalyan, now known as Kalina (from the original name Kalliana), lay on the eastern side of a forested hillock called The Rye, a mile and half south east of Vile Parle. The words Kole-Kalyan mean the homes of Jackals, Foxes and Wolves which at one time roamed these areas in large numbers freely. The people of the village gathered their fire wood, berries and Fruits from the Hill that gave a panoramic view of the Arabian Sea and the creeks, marshy lagoons, lowlands and coconut groves of Juhu in the west, the Sion Hill and Fort, Mahim, and the Mithi River flowing to the sea at Bandra in the South, the hillocks of Chakala and Bamanwada, the small hamlet of Sahar and the Marol hills and forests to the North and the village of Kurla and the Western Ghats in the east . The British saw the importance of this hill and promptly put up a military base with training facilities for soldiers and rest houses for the Officers and fully equipped medical facilities. Today the hill and its military base (called Kalina camp) still stand well maintained, untouched by slums and housing societies, buildings and projects. The Village was divided into sections like, Bhatt Pakady, Matharpakady, Corderio Wadi, Desachi Pakadi and Ranwar Pakadi, and the other village of Kolavree across the south east. The Parish Church of Our Lady of Egypt sat besides the large fresh water lake, which was used by the villages for washing clothes. Sweet drinking water was obtained from numerous wells in the villages. The main occupation of the people was agriculture. With British setting up their military Base on the hill, many of the local people got employment. In April 1930, The Kole-Kalyan Death Benefit Fund was inaugurated, presided over by Mr. Avelino Miranda at its first meeting who outlined the aims of the Benefit Fund as to render monetary assistance to the poor and needy of the two villages at the time of Funerals. The Callina Catholic Association established in 1923, won fame and popularity in both Cricket and Hockey. The Government acquired the vegetable fields to the north of Kalina village from the villagers in the early 1950s. They paid a pittance as compensation to the villagers at 4 annas per square yard. It was a forced 'take it or get nothing' situation. Today on this land stands the large apartment complexes belonging to the Government owned airline, i.e., Air-India colony and Indian Airlines colony. The village of Kalina had doubled and tripled in size by the mushrooming of buildings and slums, huts and shanties illegally built on the east, hugging the Rye Hill and spilling onto the now defunct railway line. The village is practically strangulated and overrun by slums like Jamblipada and Kunchi Kurve Nagar mainly because the ruling politicians failed to maintain the East Indian Villages as heritage properties. Kalina has been experiencing high growth over the past few years. The area lies midway between two suburban stations of Kurla and Santa Cruz, which are on the Central and Western Railway Lines respectively. It is also close to the Bandra-Kurla complex and only 15 minutes from the domestic terminals of the Chatrapati Shivaji International Airport. Kalina is also an emerging hub for commercial real estate and private companies with big names such as Microsoft, Rolls Royce (Marine Engines), Mudra Communication setting up shop there. The proposed Mumbai Police Headquarters will be in Kalina. The Santa Cruz-Chembur link road will run through Kalina as part of the Mumbai Urban Transport Project. The Church of Our Lady of Egypt was built in 1606 and the Parish consisted of the following villages under its jurisdiction: - Kole-kalyan, Aldeia, Sur, Sar, Naugar, Vancolem and Cuddy as of 1761 (Humbert I : 223 -238). According to Fr. Paulo da Trindade, the Church and the Parish was founded when Fr. Antonio da Portiuncula was Custos (1606–1609) and Fr. Manoel de S. Mathias, a great missionary baptized more than a thousand souls. The church is one of the very few churches that escaped ruthless destruction and pillage at the hands of the Marathas during the invasion and occupation of 1739, after which Secular Priests started functioning at the Church of Kalina. In the late 1960s, the Church was enlarged and renovated due to an increase in the Catholic population. On either side of the main Altar large wings were added to accommodate about 200 people. The main structure is still intact, except the Porch that was redesigned and made larger. A new graveyard was added to the north of the church as the old one became insufficient, as the people from Vakola parish have also to be buried here. The church celebrated its 400th centenary in 2006. The Ganesh Temple is the oldest temple in Kalina and provides yeoman service to residents of Kalina. Thousands of devotees make a pilgrimage here, thus making it an important event in the Kalina calendar. The South Indian Temple is located in Sunder Nagar, a large residential area consisting of row houses. It has become a magnet for tourists from all over Mumbai due to its award-winning design. Kalina also has two mosques. Kalina is home to a number of schools and colleges besides the Kalina Campus of the University of Mumbai and the Govt College of Pharmacy. The Saint Mary's School had its origin as far back as 1876 and was known as The Little Portuguese School when Fr. Custodio Fernandes was the Vicar. The school came into prominence around the year 1912; The number of students increased from 130 to 180 and a temporary structure was built in 1914 to accommodate the growing number. The only problem was that the villagers were not willing to pay any fees and hence the Diocese of Daman and the Bombay Catholic Welfare Organization had to render financial help. By now most well off families sent their children to school in Bandra, the girls at St. Joeseph Convent and the boys at St. Stanislaus and St. Andrews. The children had no transport facilities in those days and would walk the distance daily. In 1936 Archbishop of Bombay took a special interest, and seeing that there was an urgent need for a good building made a substantial gift of Rs. 7000/- and with the efforts of the Vicar and his assistant they managed to get a subscription of Rs. 1100/- from the public. The Foundation stone was laid by Mr. Katrak, the manager of the Kurla Estate. The new building had four large well ventilated rooms and could accommodate 200 pupils. The strength of the school in 1937 was now 247 pupils, the principal now was Fr. P. Pereira who deserves credit for his able management of the school. Today the school is not only a High School but also a Junior College. During the statewide floods in 2005, Air India Colony was flooded with water as much as 5 to 6 metres deep. In many buildings the water had entered in the ground floor & first floor level houses and the people had to take shelter on the upper floors. Rescue boats of Navy were requisitioned deployed in the area. Immediately after the deluge, restoration programme was taken up and portable pumps were installed at Air India colony which helped in early discharge of flood water. Santa Cruz (West) is strikingly more affluent than the eastern part of the suburb. It is bordered by Khar, Bandra, Juhu, and Vile Parle. It is primarily a residential area, with the market situated near the railway station. The residential colonies include such as 1st & 2nd Gauthan Lane [East Indians Village] (where the original inhabitants of Santacruz & Mumbai resied there) Amar Subway Society, the Reserve Bank of India Quarters, Vithaldas Nagar Colony, Sangeeta Apartments, Shree Sai Darshan CHS, Girnar CHS, Rizvi Park, Bansraj Singh Estate, Khotwadi, Bhimwada, T.P.S. 6th Residential colony Ramas Plaza, Khira Nagar and NABARD Park, Shastri Nagar,Jeevan Sona society, Main Avenue, Convent Avenue, St. Joseph's Avenue,St. Francis Avenue & Church Avenue. In the past most of the residences used to be small bungalows, which are now being replaced by high rise buildings. Sujata building was Santacruz's first high-rise (one with lift service) built by Raheja builders right across from the police station. It also has Famous Sadhana School which Produced Great Film Musician like Anu Malik. Raheja's Educational complex have many institutions. The famous SNDT, the women University is in the area, a new entrance has been opened towards Raheja college Road. The St. Lawrence High School is also one of the oldest schools located just adjacent to the Saraswat Colony. The Juhu's airplane garden is a hit amongst children and senior citizen alike. The main roads in Santa Cruz(W) are Swami Vivekanand Road, Juhu Road, Juhu Tara Road and Linking Road (now officially called Vithalbhai Patel Marg). PIN code for Santa Cruz (west) are 400054 and 400049. The Banglow of Famous Singer Kishor Kumar is on Juhu Tara Road, just behind Little Italy Cafe. The Bombay Catholic Cooperative Housing Society, commonly known as Willingdon Colony, is a tenement constructed by the Catholic community in 1930 as low-cost housing for members of their community. The Colony was spread over 5.5 acres and managed by the Bombay Catholic Cooperative Housing Society. Before the redevelopment of the Colony in 2014, the property was home to 103 trees. The old neighborhood belonging to the Saraswat Brahmins is one of the most beautiful neighborhoods in Mumbai with its private gardens, a private playground and pebbled walkways. The colony has more than 15 buildings and now consists of members that belong to various communities. The Bhramakumari Garden is located close to the colony. Santacruz (West) Post Office : Located on Linking Road, adjacent to St. Lawrence High School. Great post office for normal and simple things, but impossible to do more complex stuff like Franking. 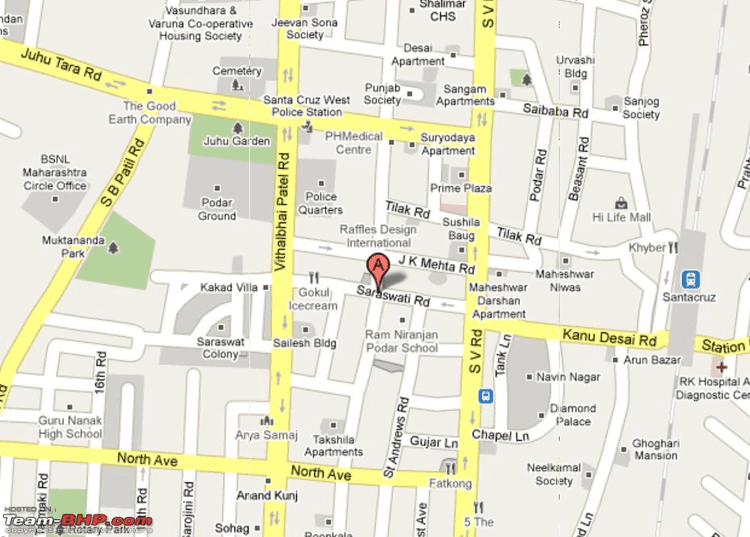 Santacruz (W) Police Station : Located on the intersection of Juhu Road and Linking Road, opposite Lion's Park. BEST Bus Depot, Santacruz (West): Located on Swami Vivekanand Road near Milan Subway (after the intersection of Juhu Road and Swami Vivekanand Road). BEST Bus Station, Santacruz (East): Located near the station, in Santacruz (East). Military Camp: It is a camp of the Indian Army Air Defense Regiment. SNDT Women's University (www.sndt.ac.in), Juhu campus which is on the Juhu Tara Road houses about 15 institutions mostly for Postgraduate programmes but also has 10+ colleges like SVT College of Home Science, PV Polytechnic, C U Shah College of Pharmacy and Usha Mittal Institute of Technology. Women Graduates can enroll for MA and MSc besides MBA and MCAs on this campus (sndt.digitaluniversity.in). The University headquarters are at Churchgate and has campus at Pune. Ramakrishna Mission (though strictly in Khar) has a yearly fest between October and December. It is widely attended for its mix of eclectic stalls selling cultural wares, clothes, religious and spiritual books, devotional music and eateries. The food stalls outside the hospital are famous in Mumbai for Chaat. Juhu Garden, formerly known for its Airplane as a Garden Ornament. Willingdon Gymkhana - a club with facilities like swimming, tennis, gymnasium, etc. The Yoga Institute is known as the oldest organized yoga center in the world. Its founder, Sri Yogendra (1897-1989), played a key role in developing medical hatha yoga, a step in the history of yoga that would later lead to the development of Yoga Therapy, this is also the oldesh Yoga institute in Asia. Hospitals: Santa Cruz general Hospital on SV Road, Nanavati Hospital. R. N. Podar School, a CBSE board school offering education from junior kindergarten to class 12. Rameshwar vidya Mandir,Datta Mandir,Vakola,Santacruz East.